The quiet summer night when my City Lights observing runs began, a night over a decade before my essays finally morphed into The Urban Astronomer’s Guide, sometimes seems like it was just yesterday. Not that I miss the early 1990s much; that was a rather lonely time for me. However, as I say in Urban Astronomer's “The Friendly Stars” chapter, when I was under the night sky with my telescope, I had no lack of friends. In addition to wanting to revisit my urban objects, I had another agenda. I am looking forward to a busy star party season this fall attending several, at least, regional events. I plan to drive to every one of ‘em—Deep South, Peach State, Maybe Chiefland, too—and I will most assuredly take a telescope with me. Which telescope? Whether I go visual or video, I’ve decided that will be my C11 and GEM mount. That being the case, I needed to check the rig out, since the last time I’d used it had been, almost unbelievably, last February during a somewhat abortive Chiefland expedition. What happened to my old friend Bertha, the NexStar 11 GPS? I got tired of her late last year. I’d used and loved the telescope for over a decade, so I was more surprised than anybody when I suddenly became dissatisfied with her. Perhaps, in retrospect, that was my first hint that I’d be going through lots of changes in the coming months (I still am). All I knew at the time, though, was that I was sick of lifting my 11-inch fork-mount SCT in and out of my vehicle. Was I cone with the C11? 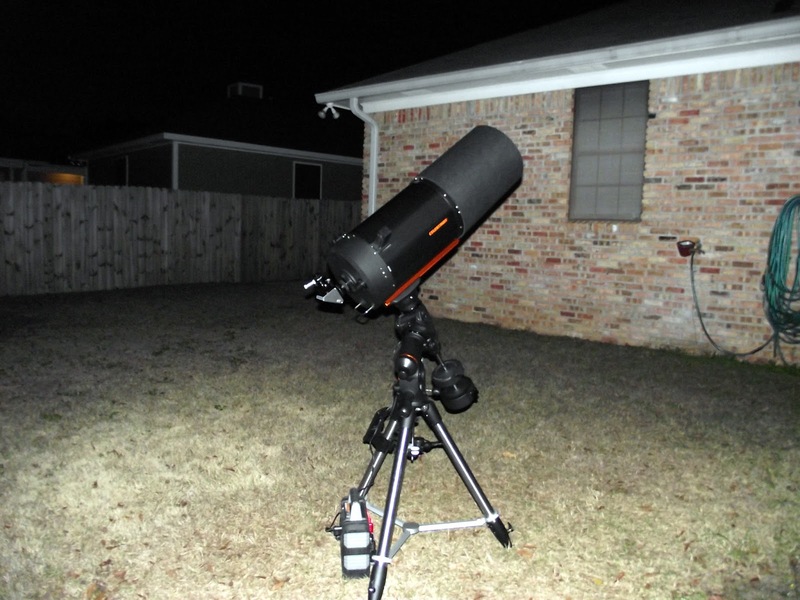 The Celestron C11 has always been the queen of SCTs for me. More practical than a C14, but with a big aperture advantage over a C8. And there has also always been a certain something about the C11, a certain je ne sais quoi that has nothing to do with the telescope’s optics. In addition, I was loath to sell a C11 with a carbon fiber tube. It’s beautiful and it reduces temperature induced focus shift and they don’t make them like that anymore. Finally, my C11 was one of the last made by Celestron as an American company (Tasco, contrary to popular belief, was an American company), and somehow that further endeared Bertha to me. OK, OK, I’d keep her, but I’d have to fix her. How the heck would I do that? Simple: G-E-M. I’d put Bertha on a German equatorial mount, which would, I hoped, kill two of those metaphorical birds with one stone. Dispensing with the heavy fork would make the telescope easier to transport, and being on an equatorial mount would improve my tracking. Yes, I had a wedge and could have run Bertha in EQ mode, but the difficulty of mounting that big scope on a wedge made it something I never did. It was a two person operation, and even with a helper was not something I cared to do often. Or at all. Which GEM? That might have been my Atlas. The draw there was that I had the mount already and wouldn’t have to spend for a new one. The down-check was that while I have gotten a lot of use out of the Atlas for prime focus imaging, I’ve never been happy with its computer. 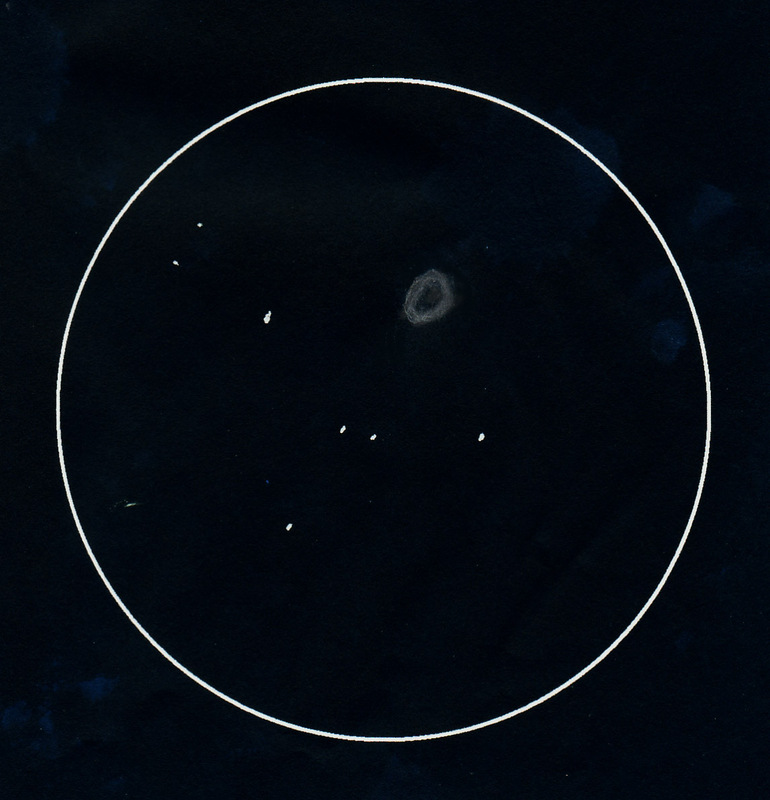 The goto accuracy is fine for imaging three or four relatively bright targets in an evening, but not for imaging 100 a night with the Mallincam. I’d also have had to change out the mount’s saddle for something sturdier; I’d have had to convert from Vixen dovetail compatibility to the wider Losmandy D system to provide as much steadiness as possible for the C11. That would mean all the other scopes (four of ‘em) I use on the Atlas would have to go “D” as well. The more I thought about it, the less the Atlas sounded like the answer. My next candidate was a Losmandy G11 Gemini II mount. The G11 is a beautiful piece of kit, several steps above the Chinese imports. It would be expensive at over three thousand dollars, but if it meant I’d be able to continue using Bertha, I was willing to bite the bullet. 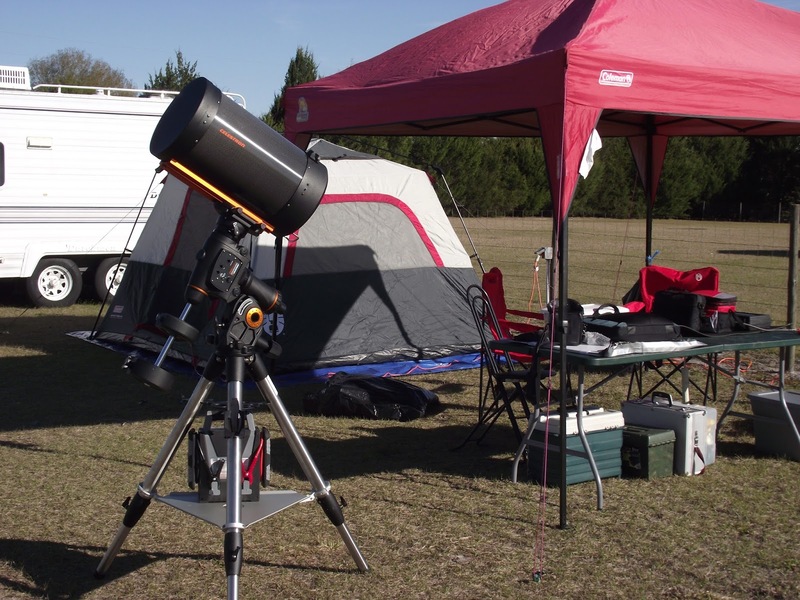 Or I was till I set up next to a new Gemini II G11 at the 2014 Deep South Regional Star Gaze. The mount was beautiful and finely made, but it was obvious to me that the Gemini II goto system, which Losmandy gets from a third party, was still a work in progress. Didn’t seem too user friendly, and the dude who owned it had a lot of trouble getting it going at all. I had little doubt Losmandy would soon get the bugs out, but the more I thought about it, the less I was convinced I needed to spend even the relatively small amount of money a G11 commands for my modest requirements. I thunk and I thunk and I thunk and I came up with two potential candidates, the first being the new Synta (SkyWatcher, Orion) AZ EQ-6. It is the modernized Atlas EQ-6 and is somewhat lighter and prettier than the original and features an alt-azimuth mode and a dual format Vixen/Losmandy D saddle. Nice looking mount, but I eliminated it for two reasons. First, I doubted I’d use the alt-az mode much, since I was sick of that for video with the NexStar 11 GPS. Also, I’d heard from owners that the mount’s goto accuracy with the hand control was more like that of the Atlas than it was different. Which left me with one mount choice. One that in retrospect seemed perfect. I was amazed, frankly, I hadn’t thought of it first, the Celestron CGEM. The CGEM had a somewhat bumpy introduction, true, but Celestron has worked hard to apply both software and firmware fixes to get the mount up to snuff, I believed they’d accomplished that, and I believed the mount would be perfect for my uses. 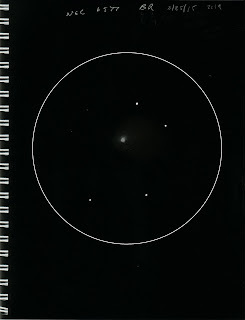 I didn’t depend on hearsay or what the good old boys wrote about the mount on Cloudy Nights, either; a buddy of mine owned a CGEM and I observed it and observed with it. What is the mount like? 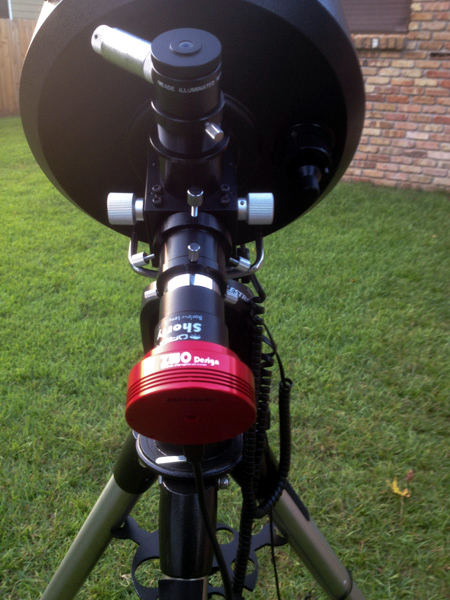 The CGEM, which is another update, Celestron’s update, of the venerable EQ-6, is much like the older Synta mount. However, it is different in a very important way. In addition to various design tweaks to make the CGEM more modern-looking and ergonomic, the SynScan controller and motors have been replaced by Celestron’s NexStar HC and servos. That NexStar HC ensures the CGEM’s goto accuracy is outstanding. Easily as good as/better than my NexStar GPS, which never missed a target that I can recall. Finally, like the modern EQ-6es, the CGEM features a Losmandy D type saddle. You can read all about the coming of the CGEM and my deforking of Bertha here, but to make that proverbial long story short, I ordered a mount from Bob Black at Skies Unlimited, and ordered a D type dovetail for the C11 from B&H Photo. 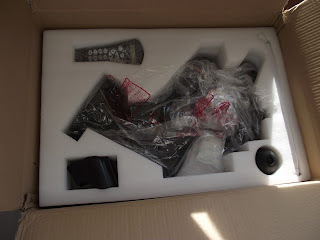 Everything arrived when it was supposed to, went together in an afternoon, and came with no surprises. 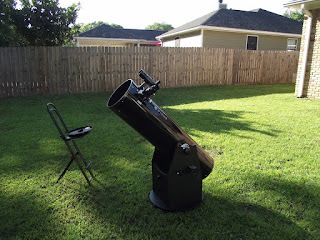 I used the mount two or three times in the backyard, and that one time in Chiefland, and the spring and summer weather closed me down till now. Confession time. But for the fact that I wanted to give Bertha a clean bill of health for the coming star party season, I’d likely have used Zelda, my 10-inch Chinese dobbie, for the night’s observing instead. If you are going visual, frankly there is no reason to lug out a big, honking C11 and CGEM. The images Zelda, provides are basically indistinguishable from those of the C11. Sure, tracking is nice, but as you-all know, I am addicted to 100-degree AFOV eyepieces, so I am not nudging the scope along all the time. Goto is also nice, but in the backyard I am not chasing minute PGC galaxies and I do just fine with a finder and a star chart. Still, there is no denying the C11/CGEM experience was a very pleasant one. 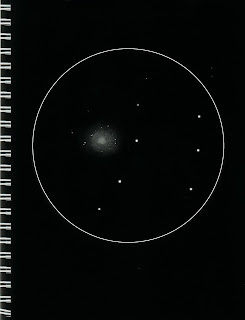 Back when I did the observing for what would become the Friendly Stars chapter in Urban Astronomer, I didn’t have a C11. I didn’t even have a C8 at the time. I was observing with a freaking 6-inch Sonotube Dobsonian I cobbled together in my garage. So, I expected great things of the night’s objects in my big CAT despite the presence of a just-past-First Quarter Moon. The seeing was not great thanks to a front passage, but it was an uncommonly comfortable night. The temperature was plunging, on its way to a record low for us for August, mid-sixties. Certainly nicer than the sticky night recounted in my book. As above, this night wouldn’t just be about observing; it would be about tuning up the telescope. I’d already accomplished my first task, adjusting Bertha’s focuser. One of the screws on the focuser backplate had loosened over the years, making focus action stiffer than I liked. Ten minutes of tweaking indoors and it was good to go again. What else other than mount checkout? I couldn’t remember the last time I’d collimated the scope, so I thought I should at least check it. Goto aligned and polar aligned (via the AllStar routine in the hand control), I sent the scope to a bright, but not too bright, star, centered it precisely, and threw it slightly out of focus with a counter-clockwise twitch of the focus control. Just enough to show me the star’s diffraction rings. Yep. Squished on one side. The rings were, in other words, not concentric. I needed to collimate by adjusting the secondary mirror. I fetched a Phillips head screwdriver from the shop and started twitching screws by small amounts. There are ways to figure out which screw you need to turn given the look of the diffraction rings, but I’ve done this so much that I am comfortable just picking one, turning it (tightening), and seeing if it is the one that needs to be adjusted. In the end, I loosened one screw by a small amount and that was enough. Yes, I preach that it’s bad to collimate by loosening screws, but if a screw is as snug as it goes, it is OK to loosen its opposite number(s) to keep moving in the proper direction. In fact, you have to. Anyhow, I re-centered the star and gave it a critical check with a 5mm eyepiece. Looked like a little bullseye when the seeing cooperated. I was done. Next? Over to M13. It wasn’t officially a member of the night’s list, but I went to it anyway for two reasons. First, again, one half of my agenda was checking scope/mount, and I wanted to be sure the gotos were up to snuff. 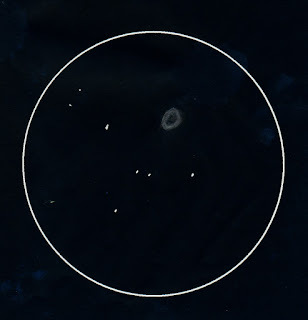 The cluster was nearly at zenith, and the area straight overhead is often a problem for mount goto systems. Not for the CGEM. M13 was almost perfectly centered in a 15mm ocular. Later in the evening I did some further goto testing. At f/6.3 with the reducer corrector screwed onto the rear cell, the CGEM got anything I requested into the field of a 5mm eyepiece at 353X. Yes, it was a 100-degree AFOV ocular, but that is still darned good in my book. The other reason I punched up M13? As I say in the book, how can you fail to visit Herc anytime he is over the horizon? The cluster, despite the Moon and despite my usual ration of light pollution, was a wonder, a sprawling thing, almost a spider shape composed of tiny stars. It looked best, I thought, in a 10mm eyepiece, which yielded just shy of 180x, which was enough to darken the background sky considerably. I spent a long time staring at the Great Globular, but not too long. As I also observe in The Urban Astronomer’s Guide, dessert only does not a nutritious meal make. Time to prowl the reaches of the serpent bearer, Ophiuchus, just as I did on that decades ago night. Where to start? With his best of the best, M10, one of the so called Twin Globs. Unlike that 1993 night, when I had to do considerable squinting to make out the subdued stars of Ohiuchus in the summer haze, I just mashed “M-0-1-0” into the hand control, Bertha’s CGEM made its noises (which are at least a little less grating than the CG5’s weasels-with-tuberculosis sounds), and we were there. What did I say about it back in the day with my little 6-incher (probably equipped with a 25mm Kellner)? I thought M10 was beautiful. 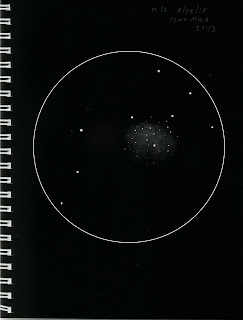 When I switched to my prized 6mm Orthoscopic, I could make out plenty of stars around the cluster’s periphery. Heck, I even thought I spied a few near the core with averted vision. Today? No, my eyes are not as good as they were back then, but 5 additional inches of aperture makes up for a lot of optical deficiencies. In the 10mm 100-degree ocular, M10 was far more beautiful than it had been in the 6-inch. There were still the stars around the cluster’s edges, just many more of them, and looking at the glob’s center revealed still more. And more and more. With direct vision. M10 is a Shapley – Sawyer Class VII globular. It’s loose enough to allow you to easily resolve stars across its face, but tight enough so that it really “looks like a glob.” Wonderful. Get out and look at it tonight, folks. M12 is the other twin. But it is only a twin in the sense that it’s nearby, about three and a quarter degrees from M10. It looks nothing at all like the previous object. M12 is much looser, a class IX. It’s not so loose than it fades away into the background like the really loose NGC 5053, but it was loose enough to be somewhat of a pain in the six: “I was disappointed...it’s not nearly as good from this suburban site as I’d hoped. 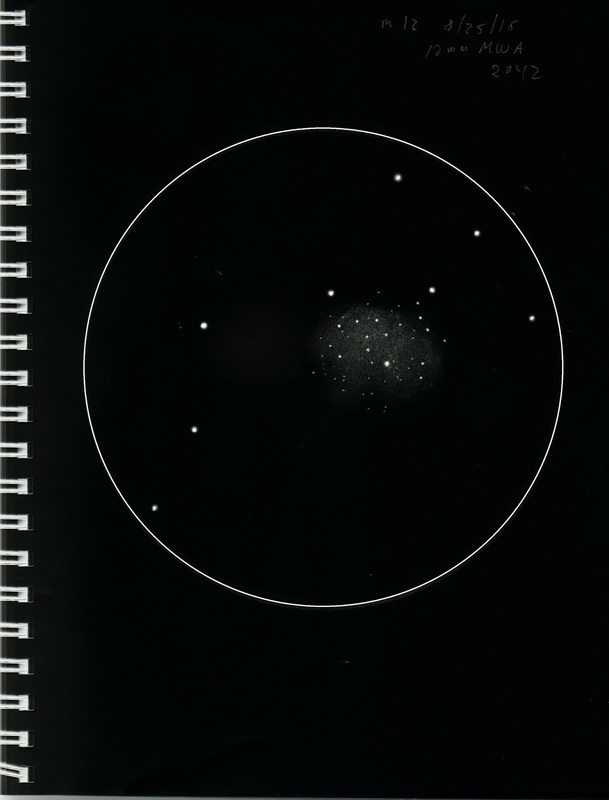 It is a vague, ghostly glow 3’or 4’ in size at most in my scope.” I did note a little central condensation, signs of the cluster’s core, but that was not easy. Worse, I couldn’t resolve a single star anywhere in the cluster, even with a magnification of 250x. Again, the 11-inch made plenty of difference. 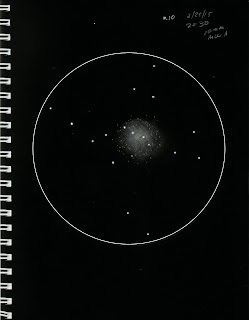 It still wasn’t like looking at a photo taken from a dark site, but it was very obviously a globular star cluster showing a goodly numbers of stars both at its edges and, thanks to its looseness, in the core area. In the C11 the central region was easily distinguishable with direct vision. It wasn’t as good as M10 by a long shot, but still good. Onward. Next up was Messier 5, which on an above average night can impress me more than M13. This was the only object of the evening where the 6-inch came close to equaling the C11. And that was only because Serpens’ big-glob was in the trees and being partially blocked. Frankly, the view was still better in the C11, where I could make out stars near the core, but nevertheless the impression was much the same as it was with my old cardboard dobbie: “Lovely with a compact core. 200x reveals plenty of outlying stars but not many in the center.” The cluster is strongly elongated, something I picked up on easily with my small scope and which was obvious in Bertha. The next Friendly Stars DSO, M107, wasn’t just skirting treetops, it was completely blocked, so I bypassed it and continued on to another Ophiuchus globular star cluster, M62, which was in an open area. This is a rather tight Class IV glob, which makes it nice and bright and easy to pick out even for observers at more northern latitudes. While M62 is bright looking and actually bright in fact at magnitude 6.5 and 15’ across, it’s dimmer and smaller than the previous globs, and I had to use high magnification, averted vision, and a dark cloth over my head to keep out stray light in order to resolve a few stars with the sixer. If you’re going to tour Ophiuchus, you have to be in the mood for globular star clusters, since they are his most prominent objects. They are not his only objects, however. There is also a pretty little fuzzy of a planetary nebula, NGC 6572, a.k.a. “The Blue Racquetball Nebula.” It lurks not far from 67 and 70 Ophiuchi and is not hard to track down even without goto. The problem comes when you get there. Can you distinguish the Racquetball from a field star? The object is bright at 9th magnitude, but also small at 11” across. In the 6-inch I had a hard time telling it from a star even with the 6mm Ortho. In fact, what keyed me in that I had found it was the object’s striking blue color, which made it stand out immediately. In the C11, it was easier to pump up the power to over 300x and resolve the planetary as a little fuzzy racquetball (I think tennis ball is actually more apt). The funny thing, though? Barely a trace of the planetary’s blue color did I see. I thought maybe, barely, I could describe it as a very subdued blue-gray, but that was almost an exaggeration. What was the problem? Worse seeing than that 1990s night? Too much glass in my 9-element eyepiece? Older eyes? Who knows? I’ll have to come back to this one before the season is out. I long to see that face-slapping color again. And that was it. Oh, I didn’t intend for that to be it. There were a few more objects in my list, and I wanted to backtrack to M107 when it was out of the tree leaves, but that was not to be. As sometimes happens, the leading edge of the front had some clouds behind it and they closed me down for all practical purposes. The Moon was higher now, too, definitely interfering badly. I threw the big switch. "Lonely? By the end of the night I didn’t feel a bit lonely. After soaking in so much beauty, the night and the Universe didn’t seem mysterious or forbidding. Even the distant, enigmatic globular clusters seemed no stranger than friendly bees buzzing around the hive of the Milky Way’s center." What has changed in the three years since this one was posted? A surprising amount. In addition to the changes in my personal outlook on life that began early in 2015, and which it would probably bore you to hear about, there was the move from my old home downtown, the vaunted Chaos Manor South, to the western suburbs. 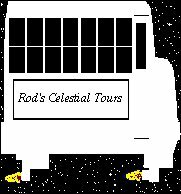 What effect did that have on your old Uncle Rod's astronomical life? I moved to the same general area of town from which I'd viewed Ophiuchus' wonders on that night in 1993. While the skies in my new location were not perfect, they were (and are) no worse than they were over 20 years before. That meant I could profitably observe from my backyard for the first time in many, many years. Today, there is simply less motivation for me to load up the 4Runner and head for a star party in the hinterlands. I haven't been to an organized star party this year, and it doesn't look like I'll attend one before 2018 runs out. 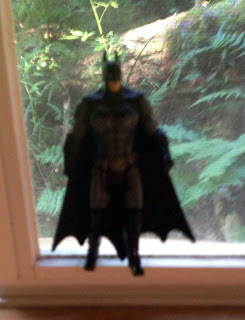 There is another factor in addition to me being able to observe from home. I'll admit, the older I get, the less I like roughing it in any fashion. Even to include a star party bunkhouse. Call me astro-wimp, but if I can't repair to a motel room after an observing run at a star party, count me out. The third reason for a sea change in my amateur astronomy is the injury to my back I sustained not long after we left Chaos Manor South. Thanks to that, big telescopes and big mounts are no longer an option for me. I tried to keep going with the C11 using the CGEM, but it was a no-go. Bertha, CGEM, and Atlas were all sold. That really wasn't a bad thing, though. I never did much long-exposure imaging with the C11--and long exposure DSLR imaging is my focus in astrophotography now. As I noted above, for simple visual observing from the backyard, it's not much fun setting up a C11 and a big German mount. When I go deep sky cruising in these latter days, it is with my 10-inch f/5 GSO Dobsonian Zelda, who is in some ways actually preferable to the C11. When I want to take pictures, it is with with an Edge C8 or 5-inch APO on a Celestron AVX or Losmandy GM811, both of which mounts are far more pleasant to use than the CGEM or Atlas. Anyhow, as I tried to communicate in the post above, it's not really the equipment you put into amateur astronomy that makes the difference. It is the heart. 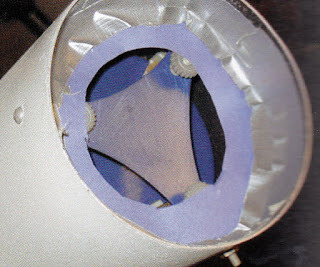 That long-ago August run with an humble 6-inch Sonotube reflector is still one of the most memorable of my life. 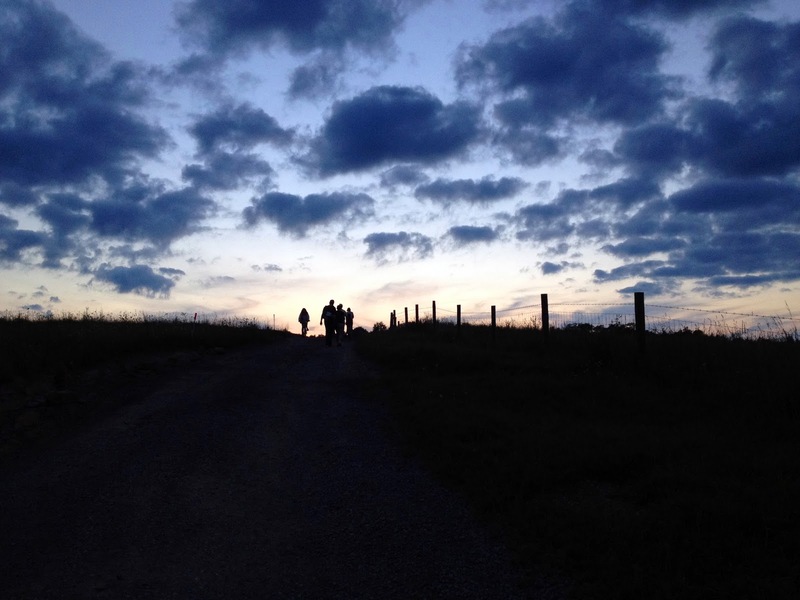 I knew there would be a 2015 edition of one of my favorite—maybe my absolute favorite in some ways—star party, the Almost Heaven Star Party held at Spruce Knob Mountain in West Virginia. Yes, I knew there’d be an AHSP 2015; I was to be one of their speakers, and I had my airline tickets. But part of me just didn’t see how there could be one. The reason was that a guiding light, perhaps the guiding light behind the star party, Phil Wheery, was taken from us some months ago. If you didn’t know Phil, I’m sorry you missed him. In addition to being an outstanding amateur astronomer and a great organizer, he was just a great guy. Over the course of my life, I’ve met few people as kind and generous as Phil. Without him, I wondered if AHSP could ever be the same. Well, I was going to find out. Early on Friday morning—seriously early—I set out for Mobile Regional Airport to catch the 6 a.m. redeye for DC. In order for me to get to the airport in time to catch a ride with the AHSP person who was going to take me up the mountain, I had to do the early one. Oh, I probably could have made it to Dulles in time to catch my ride in easier fashion by driving to Pensacola for the non-stop to Washington, but that came at a price: the Bayway. In order to get to Florida, you have to cross Mobile Bay, and you do that via a stretch of I-10 that runs over a long two-lane (each way) bridge across the Bay. There’s a tunnel, too. In the summer, and particularly on Fridays and Sundays, traffic can be backed up for miles and miles with tourists going to and coming from the Alabama and Florida beaches. Not fun. Even if the traffic were clear on the return leg, I’d have to drive at least 45-minutes to get home from Pensacola, and when you are tired out from star partying that isn’t much to look forward to. So, the 6 a.m. flight out of Mobile it was. Outbound wasn’t that bad. I don’t expect U.S. Airways, America’s version of the notorious Soviet airline, Aeroflot, to be anything but terrible. Their gate personnel are among the most confused and unfriendly I have ever encountered. I know that, so I was not disappointed. I’ll admit I am still scratching my head, however, at the fact that a well-before-noon flight wouldn’t have freaking coffee available onboard. Oh, well; it is what it is. I expected the first leg of my journey, Mobile to Charlotte, to run late. It always does with U.S. Air. I was a bit worried about my connection, and I was correct to be, as I arrived at the gate for the Charlotte – Dulles flight just before the doors were supposed to close. For once I was lucky. I went up to the podium and inquired as to whether boarding was over, and learned it hadn’t even begun. This one was running late too. I learned that, by the way, not from the Gate Agent, who just stared at me and said nothing, but from a fellow traveler. Anyhow, in about another hour and a half I was landing in Washington, retrieving my suitcase, and meeting up with ace observer and AHSP staffer Donna Blosser. Donna is not just a very nice woman; she is a committed and talented deep sky observer, so naturally we had a lot to talk about on the way up. The journey seemed a lot shorter than the three and a half hours or so it consumed, and almost before I knew it, we were turning off for the drive up to the Mountain Institute (TMI) Spruce Knob site. We stopped at the Registration Tent where I got my packet and my T-shirt, and was directed to meet up with AHSP’s Kathryn Scott, who would get me settled in my room. The last several years, I’ve been in the dorms, but this time I was back in a small yurt. Yep, you heard right, “yurt.” The trope used for all the TMI facilities was buildings in roughly the shape of Mongolian yurts. They are not tents, but they do look like something you’d find on the steppes of Asia. My yurt, the same one I’d stayed in the year a tremendous thunderstorm threatened to sweep the observing fields clean of scopes and tents, had been repaired and rehabilitated and was comfortable enough. Next step once I was unpacked to the extent I was going to unpack, was to walk down to the Main Yurt to see what was going on. One thing that was going on was that NOVAC, the Northern Virginia Astronomy Club, AHSP’s parent, more or less, organization, had set the facility up with Internet access. I was warned it was kinda slow, but I found it to be quite good. When you don’t have a telescope onsite to tinker with in the daytime, the hours before dark can be long ones, so I was happy to be able to surf the ‘Net. Another nice surprise was seeing my old friend and former Editor at Sky & Telescope, Bob Naeye. Like me, Bob has been speaking at AHSP since forever, almost since the event began, and he wasn’t going to let a little thing like his retirement from the magazine stop him from continuing to do so. Retirement had obviously agreed with Bob who, like me, retired early and good on him. Supper was next. And you know what? This year, more than any year before, I was happy with the food. Maybe because I have turned the page on my diet (amongst other things) and was down with the vegetarian and other health-conscious food choices the TMI people always offer at least as alternatives. Some of the (good) sweet and sour chicken and a salad and I was a happy camper. Literally. After the meal, it was time for the first major talk of the event, which was Bob holding forth on the Hubble Space Telescope’s achievements over its now surprisingly long lifetime. It’s a story I know well, and because of that and because of my weariness from the trip, I was afraid I was going to nod off during Mr. Naeye’s presentation, but, you know what? That darned Bob did such a good job that he kept me awake. Kudos. After Bob wrapped up, I strolled onto the deck of the Main Yurt to have a look at the monitor out there, which was displaying satellite imagery and the Clear Sky Clock (err… “Charts”). It didn’t look absolutely horrible, but it didn’t look good either. Lots of light blue squares in the transparency row for Friday evening. So what? I, like everybody else, headed for the spacious observing fields anyway. There, I spent a little time with AHSP honcho and NOVAC Vice President Chris Lee and his charming wife, Erin. As we chatted, that TMI magic began to happen. The clouds started to disperse with the setting of the Sun and we were soon looking at a burning Milky Way. There may be slightly darker spots east of the Mississippi than TMI, but I haven’t visited them. If deep sky observing and imaging is your goal, I don’t think you can do better than AHSP unless you travel to a western desert. Not that I did much observing. Oh, I looked through a scope or two, but mostly any views I had were through the extremely modest instrument I’d brought along, a 6x30 Celestron monocular (which did a surprisingly good job on the summer Milky Way and M22) while I was firmly ensconced in a lawn chair setup outside the RV of NOVAC President Terry Cabell and his wife, the incomparable Pat. What I mostly did was sit and talk and drink the wine Pat had laid out (the Northstar Merlot was a big surprise and a treat). One of the best things about AHSP is the kindness and friendliness of the people I encounter there. If I mentioned everybody who was nice to me this year, I wouldn’t have space for anything else. However, I do want to give a shout-out to just a few of the many people who went out of their way to see I was happy and taken care of. In addition to Terry and Pat and Chris and Erin, there was star party dynamo Elizabeth Erickson, whose good humor and enthusiasm never fail to cheer me up. There was the aforementioned Kathryn Scott who made sure my trips up and back down the mountain were as easy as possible. Finally, Donna Blosser had, I'm sure, rearranged her schedule just to fetch me from the airport. I could keep going, but you get the picture. The only person missing was Phil. Or was he? If he wasn’t quite there with us on the field, it was as if he were at least looking down on us from the Great Beyond. 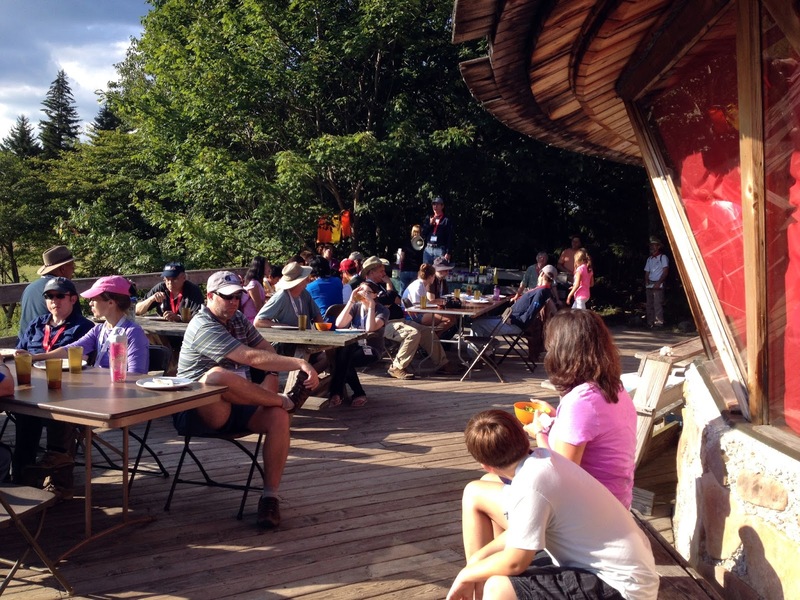 This year’s star party set a record with three beautiful nights. Coincidence? I think not. I believe ol’ Phil was watching out for us from his spot Out There, which no doubt has far darker and even more star-spangled heavens. In my hoodie, wearing a ballcap, I was comfortable out on the field for quite a while, but inevitably, the cold—it was in the 50s in August if you can believe that—began to seep into me and it was time to say goodnight and hike back to my yurt. Which I did, falling into a sleep that didn’t end till after 8 a.m. the next morning. Yep, the days can be long at a star party when you don’t have any astro-gear or much else to mess with. Luckily, there were more good presentations in the afternoon, including Elizabeth Warner’s fantastic talk/demo on capturing asteroid occultations with video cameras. So inspiring was her talk that it made me want to get involved in occultation chasing. Naturally, I also had my own talk to prepare for, so while the afternoon dragged a little bit, it wasn’t too bad and was punctuated by more good food including excellent burgers (sans buns for me, natch) for supper. You can bet I had a look at the heavily laden tables of the event’s sole vendor, Hands-on Optics. There was plenty of good stuff there, but nothing I just had to have, so I kept my credit card in my wallet. Oh, I could have bought something, but my current mindset is against buying more astro-junk. Much better would be actually using what I already have, which is way too much anyway. Then it was time to go on. My talk this year was “Observing the Old Fashioned Way,” which concerned my at least temporary desertion of computers and cameras and electronics for time honored visual looking with my simple Dobsonian, Zelda. I wanted this talk to be fun. As I told Terry on the field the previous evening when our discussion turned to star parties and conventions and amateur astronomy in general, the most important thing we can do for ourselves and our fellow amateurs and new recruits is to show and tell how much fun amateur astronomy is in addition to all its other good points. I think I accomplished that. I had plenty of slides and I believe I conveyed some good information for both newbies and those who’ve been away from eyepieces for a while, but I also believe I did it in a manner that was light, even for me. I flipped through my slides at a good pace, and was done in what was a hurry for me, just under an hour with questions. Then it was time to worry. 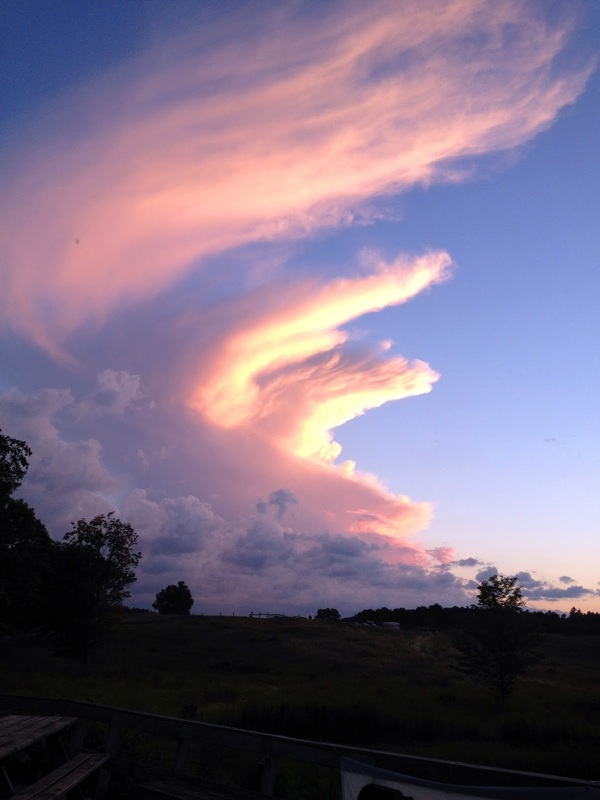 At sundown, the sky was looking awfully putrid. Almost scary at times. Clouds were just boiling out of the west-northwest. I suspected the scent of skunk was in the air. So much so that I told Chris I thought I should move my SCT collimation workshop from the field to the Yurt. Surprise. Almost unbelievably, the clouds began to drift away just as it got dark. Oh, there were lightning flashes to the north and to the south, but they were always way north and way south and never got close. Saturday was another charmed night, and was at least as good as Friday had been. Me? At 9 p.m. I trotted back down to the Main Yurt. I could have done my workshop on the field, but I didn’t want to confuse things by changing the location again. In the end, I believe that was a good decision. Being able to explain the supposedly black art of SCT collimation in a lighted room with slides and diagrams showing how to adjust a scope was probably more beneficial for most of my audience than trying to show them how to do it on a dark field would have been. Next time, I do hope to do a hands on, but I was satisfied with the workshop, anyway. Then it was back to the field for good times with old friends and good times with new friends. I never really got chilled Saturday night. It was damp enough, but maybe not quite as damp as Friday had been. The cold didn’t seem to seep into my bones as quickly as it does on a more humid night. I was also much more rested. I hung in till about twelve before saying night-night. Since my flight would not be till early evening Sunday, for once I didn’t have to rush around in the morning. A leisurely start to the day with a welcome breakfast, a little email reading, and visiting with my fellow AHSPers made for a more relaxed departure day. I talked to Erin Lee, who'd kindly volunteered to deliver me back a Dulles, and we decided it might be good idea to hit the road at 11:45 a.m., since the air transport system had had big (computer) problems Saturday, and we feared it would be badly snarled Sunday, too. It was a pleasant drive back to DC with Erin and her son, Patrick, an outstanding young amateur astronomer, and I was in a good mood. Till we got to Dulles, that is. The traffic jam out front looked like what you’d normally see just after/before a big holiday. Good thing we were several hours early. I said my goodbyes and began the process of trying to get through security. I finally made it through the crazy long lines, and plunked myself down at the gate. I had a couple of books, and Dulles has good options for dinner, so all-in-all the wait was not onerous. Hah. It was to be over an hour before they let us on the aircraft. Why? They finally fessed up. One of the crew, a particularly irritating cabin attendant, had lost her luggage and they were hunting all over the airport for it. I wondered how long they’d have held the flight if I’d lost my bag. In the end, I put it down not so much to arrogance on the part of the U.S. Airways folks as to the fact that most of them, and especially the gate personnel, almost to a man and woman, just don’t seem to know what they are doing. A new entry will be waiting for you right here next Sunday morning. Why nothing new this Sunday morning? I've been on the road for the legendary Almost Heaven Star Party this past week, which is what you will hear all about next time out. Same bat time, same bat channel! Yeah, I know, sitting under stagnant and hazy or cloudy and stormy skies as August comes in, it’s difficult to believe the fall star party season will soon be here, but it will be. 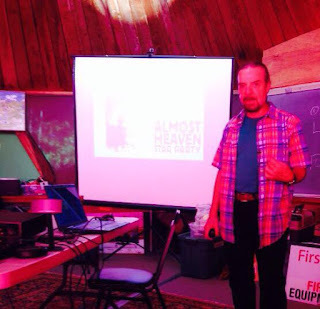 It actually gets under way for me in mid August with the famous Almost Heaven Star Party in West Virginia. From then on for me it’s one after another till November begins to wane, often as a speaker, but sometimes just as an attendee seeking relief from the months of deep sky deprivation we’ve typically been through thanks to a stormy summer. I won’t be taking a telescope to AHSP, but I will be hauling a load of gear to the other ones I do this fall: the Deep South Regional Star Gaze, the Peach State Star Gaze, and the Chiefland Star Party. Maybe even one or two more. I don’t just plan to do a bunch of star parties this fall, either; I plan to do ‘em right after a near-all-summer layoff. I’ll be packing Big Bertha, My C11, and her CGEM mount—or at least Mrs. Emma Peel, the Edge 800, and her VX GEM. Mallincams. DSLRs. Computers. Monitors. The whole nine yards. You might not have to do anything to the telescope. If you’ve got an SCT or a refractor or another semi-sealed tube scope that’s done nothing but sit, you probably won’t have to do much more than give the corrector or objective a quick eyeball to make sure it doesn’t need attention. Don't mess with it unless it needs it; as you know I am very much against cleaning optics unless they are really dirty. However, if yours is an open tube scope, a Newtonian for example, it might be time to clean. I don’t clean the mirrors of my Newts every year, though; I don’t have to. “But Rod, but Rod, I shined a 10,000 candlepower flashlight down the tube and saw some dust!” Leave that dust alone, Skeezix. It’s not hurting you. Optics will almost always have a little dust on them, and it will not affect images. Yes, modern mirrors are over-coated and their surfaces are not as prone to damage as they used to be, but you still run the risk of doing more harm than good by cleaning. Pollen, fingerprints, bird poop? Yes, clean. A little dust? No. If you simply must clean, go the traditional route. Rinse in the sink. Wash with tap water with a few drops of Dawn dishwashing detergent added. Scrub problem areas with wetted lens tissue or white Kleenex applying little or no pressure. Rinse with distilled water. Correctors and objectives? I use a Lenspen for small areas. For larger areas I employ the time tested combination of original blue Windex, original white (no lotion of course) Kleenex, and canned air. Otherwise? Check out your OTA (optical tube assembly) fittings. I like to mix and match different finders with my scopes, so I always triple check that the finder in the case with the scope is the correct one for the finder mount shoe currently installed on the tube. If you have an illuminated finder, now is the time to replace those cursed little button cell batteries. Give the focuser a few twitches to make sure it’s in tune. Maybe polish up the scope’s tube with a little Pledge if you want to impress your buddies, and you are done. This used to be easy. “Does it still move when I undo the locks?” “Does it track in R.A. when I plug the plug into a wall socket?” That was it. Today, it is far more complicated since you are likely using a computerized goto mount or at least digital setting circles. At the minimum, I’d set the mount and scope up in the house and do a fake alignment and few fake gotos to make sure the scope points in approximately the correct directions given the time you entered in the hand control. Check all cables and connections and clean with zero residue electronics cleaner as required. Doing a fake goto alignment in the house or seeing if your digital setting circles seem to “track” OK when you move the scope is a minimum. 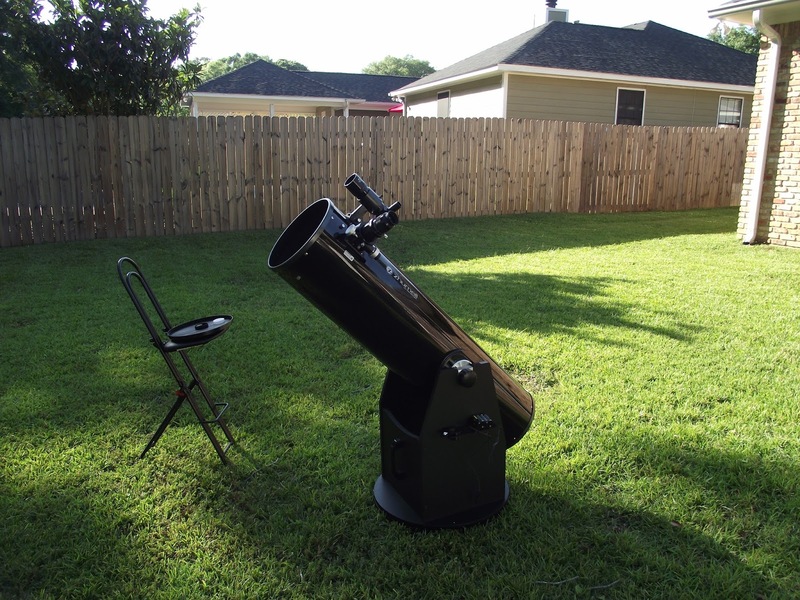 Personally, I would not think of taking an electronically assisted telescope, especially one that hasn’t been used in a while, to a star party without a complete check-out in the backyard. If your mount, like most of Celestron’s newer ones, features a real time (battery backed) clock, make sure it is still keeping time. If you have not set the time in months, it will no doubt be a few minutes off, but shouldn’t be more than that. If it is, replace the battery. Go ahead and change the battery in your digital setting circles computer whether it still seems OK or not. 9-volt batteries are cheap and it’s easier to replace one at home in the daytime than in the middle of the night on a dark star party field. Finally, get your power squared away. If you will be using batteries, make sure they are in good shape. The best way to do that is by keeping them in good shape. Lead-acid batteries (including jump start battery packs) should be charged for 12-hours after each use. If they have not been used over the course of a month, charge them for 12-hours anyway. If you are smart, you will test your batteries with a battery tester before the event. Jump start packs have built in ones, but one for your golf-cart or deep cycle battery is only a few dollars. Checking the voltage of a battery not under load with a multi-meter will tell you little. 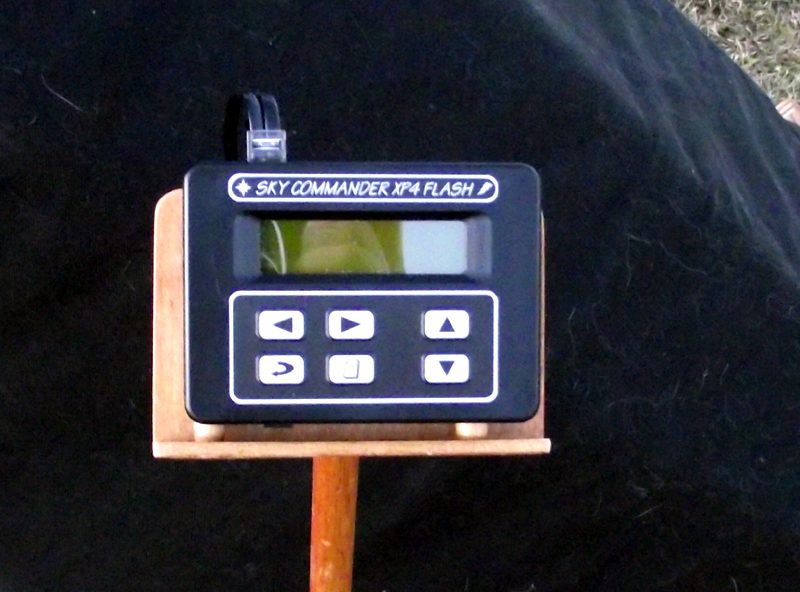 A battery tester is better and is convenient to use. Check ‘em out. Make sure the ones you’ll want to use at the event are in your case. In the course of observing from the backyard, my oculars tend to get distributed around the house. Cleaning? Sure, if they’ve got gunk on ‘em, clean ‘em. Eyepieces are like camera lenses; they are tough compared to first-surface mirrors and will stand up well to repeated wrong-headed cleaning. I use nothing but a Lenspen on eyepieces. Might be a good time to fill in the gaps in your eyepiece collection. If you, like me, are addicted to 100-degree apparent fields of view, this is a particularly nice time. Several vendors—Explore Scientific, SkyWatcher, Meade, Lunt, and William Optics—have introduced lines of ultra-wide 100s in the 200 dollar range. About what I paid for my Zhumell Happy Hand Grenade 16mm 100-degree a few years ago. And guess what? All are very much better in every way that the good, old HHG. Do the usual things…make sure all the software you’ll want to use is installed and operational. That’s particularly important right now, since many of you will have just updated to Windows 10. Now, Win 10 is much more like Win 8 and Win 7 that it is different, so theoretically there shouldn’t be any compatibility problems. What ran on 7 or 8 should run on 10. But, like I always say, “Trust but verify,” which is one of the few things Ronnie R. ever said that I (sort of) agreed with. It might not be a bad idea to test your really critical programs, like auto-guiding software, in the backyard or at the club site. Make sure you’ve got your computer power sussed, too. If you are going to be at a site without AC, you’ll need batteries. Unless you are running a little netbook, it is unlikely your laptop’s internal battery will last more than a couple of hours. How much battery you need depends, of course, on your computer’s power consumption. Even if your site has AC power, you might consider taking along a battery for the computer (and scope, too). I’ve been to more than one event where every single power outlet on the field was taken up by the time I arrived, and I had no choice but to run on batteries. How do you actually run a laptop on a battery? There are DC to DC solutions, but most convenient for me is a simple inverter. DC to AC inverters put out power more than good enough to keep the laptop’s internal battery charged. Choose one with enough current capability to suit your machine (taking into account any devices like cameras that will be powered from the USB port of the computer). Harbor freight is a good source of inverters. A 17ah jump start battery will power my laptop for an entire run, and I found an inverter at HF that plugs right into the jump starter’s cigarette lighter socket. If you will be taking pictures, check the camera thoroughly. Shoot some pictures if possible. Even just terrestrial ones with a DSLR or a quick grab of the Moon with a CCD. Ensure all the cables you need are present and in good shape—please triple check this. Adapters to attach your camera to your telescope should be in the camera case, not on a shelf somewheres. 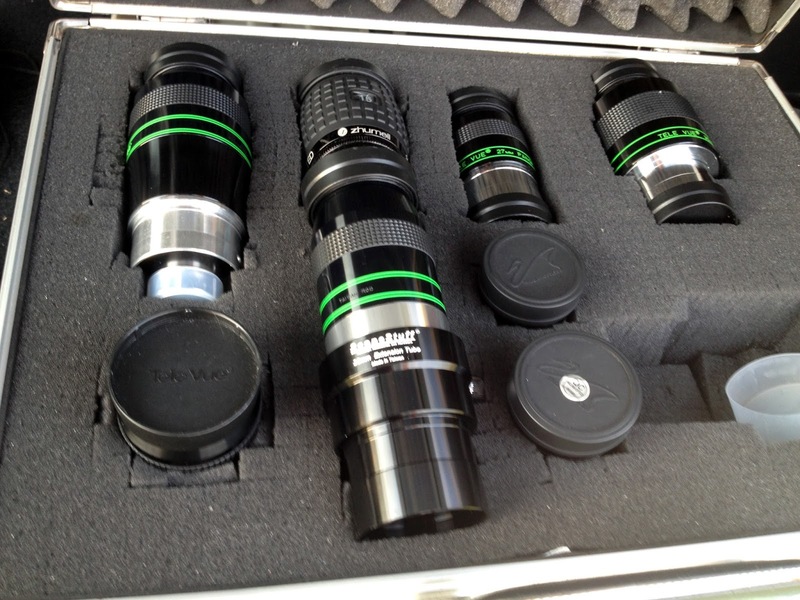 Other imaging items like guide scopes or off axis guiders should be in the camera case or telescope case, too. If you run a DSLR, make sure the camera battery is in good shape, that you have an extra on hand and that all are charged. If you want to be extra safe, you’ll invest in a 12volt or AC adapter for your DSLR. If you use a cooled CCD camera and your camera features a desiccant pack that keeps the interior of the camera dry and frost free, make sure the desiccant is ready to go, that it is dried out. With most cameras that involves baking the desiccant plug in an oven at low temperature for several hours. A few cameras allow/require you to replace the desiccant. Do whatever you need to do; a frosted-up chip makes a CCD camera utterly useless. If you camp on the field like I occasionally do—when there is no other alternative, usually—inventory your stuff: tents, sleeping bags, cots, camp tables, and ancillary items like camp stoves, fans, and heaters (ones that are safe for use in tents). 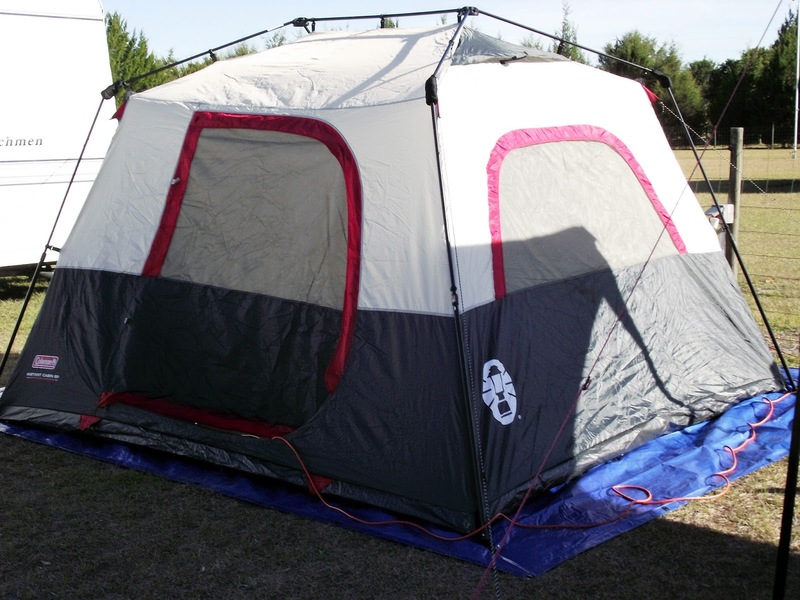 This is the time to replace or add to your camping stuff as required, in late summer while the outdoor stores still have plenty of camp-out stuff on the shelves. Is your tent in good shape? Large enough, and, most importantly, tall enough, to make it bearable for a few days? A small tent you cannot stand up in when you are changing clothes, is a recipe for, yes, an unhappy camper. Pay attention to your sleeping bag. Is the one you have appropriate for the temperatures you’ll face? What will you put the bag on? Some people can live with air mattresses or even foam pads. Not moi. I like to put my bag on a cot, which is a much more comfortable arrangement for me. 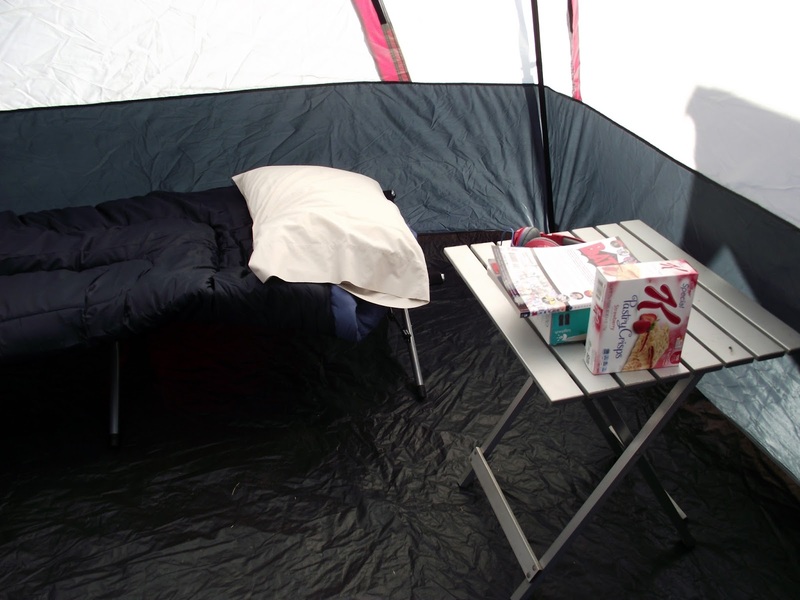 Not only is a cot more comfortable, being off the cold, cold ground, even with a good bag, keep you warmer. Finally, if you are using a Coleman stove or a catalytic heater, make sure these things are in good working order and that you have enough gas bottles to last your entire stay (always buy at least several more than you think you will need; propane is cheap). If you are planning on cooking your meals onsite (not me), begin gathering up the pots and pans and implements you use when doing camp food. You’ll likely need extension cords. Round up yours and make sure they are longer than you think you will need. If you are in the least doubtful, get to Wal-Mart and buy an inexpensive but reasonably heavy duty outdoor cord. While there, pick up plenty of batteries in sizes appropriate for everything you have that needs batteries. One other thing you might as well take care of is warm weather clothing. If you’ve been at amateur astronomy for a while, you know that you will never be colder than you are when you are out under a clear sky standing stock still or nearly so for hours looking through a telescope. If you don’t have enough warm clothing (layer yourself), get to the store and get what you need when they start putting out the winter things (won’t be long). Along the same lines, visit an outdoor merchant—Academy, Bass Pro, etc.—ASAP and get a season’s supply of those little chemical hand warmer packs. They are useful to keep not just you warm, but also things like telescope hand controls. Unfortunately, the stores, down here anyway, tend to sell out quickly since hunters snap them up as hunting season nears. “Early bird catches the worm” and all that rot. And that does it for now. Squirrel your new purchases away somewhere where you’ll be able to find everything easily in a month or two when it is time to PARTY. When we get a little closer to that time, we will take up the next step: getting all that stuff in your vehicle. If you’ve been with me for a while, you know I spent over twenty years under an urban sky in downtown Mobile, Alabama’s Garden (historic) District. Despite light pollution that at its worst could extinguish stars much dimmer than magnitude 3.5, I still wanted to observe from home—occasional trips to the club dark site and star parties weren’t nearly enough. So, shortly after I moved in at Chaos Manor South in 1994, I began to survey the deep sky from my bright backyard. At first, seeing much of anything other than open clusters under those conditions seemed a hopeless task. When you can only make out the three brightest stars in Ursa Minor, how can you hope to observe distant galaxies? But I persevered and eventually had surprising success. Not only did I conquer the entire Messier (even M101 and M74) from my backyard and similarly bad urban sites, I saw many objects from the NGC and more obscure catalogs. What I saw of deep sky objects from the backyard of the legendary Chaos Manor South didn’t usually match what the objects would have looked like from good skies, but I had a ball anyway. I had so much fun I wanted to share my experience and my urban observing techniques. 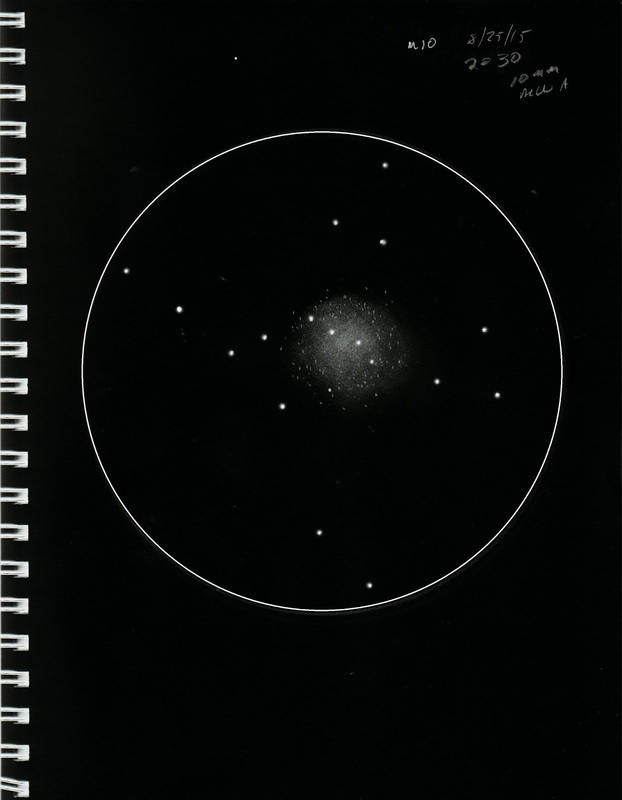 Which I eventually did in a book, The Urban Astronomer’s Guide. The Guide isn’t perfect, but I am still pretty happy with it today. Probably happier than I am with anything I’ve ever done. I still consult my own book at times, and that ought to tell you something. If you’ve been hanging out here long, you also know that a little over a year ago I moved from downtown to the far western suburbs. Not only did I gain a mostly tree-free backyard, I went from magnitude 3.5 to a zenith limiting magnitude of 5.0 on clear winter’s nights. While a 1.5 magnitude gain doesn’t sound like a huge difference to newbies, old hands know that it increases the number of visible stars tremendously, and that the sky background in the eyepiece is much darker. I had the occasion to pick up Urban Astronomer the other day after not looking at the book for a while, and after I got the information from it I was seeking, I got to thinking. My skies are better now, but they are still not perfect. Wouldn’t it be fun to go back through the The Urban Astronomer's Guide's list of DSOs and see how much, if any, better they looked from the new manse? I’d been seeking a visual project I could execute from my new backyard. Sounded like this might be it. Going back through the urban objects would also give me a chance to share the tips and techniques I developed and/or employed for dealing with bright skies when you’re chasing dim objects. 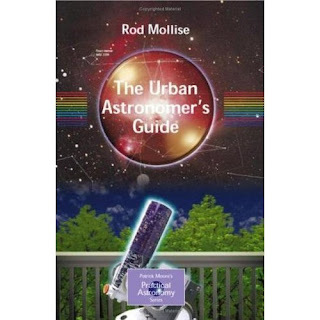 Over the years of working on Urban Astronomer—it began as a series of columns in my club newsletter in 1993 and didn’t become a book till over a decade later—I did a lot of thinking about and experimenting with what I called "city lights observing techniques," and developed some pretty strong opinions on everything from light pollution reduction filters to telescopes to star atlases. Let’s start this first installment of the new project with a few preliminary tips. None of these is earth shattering; most are just common sense, but when you’re battling light pollution, whether from a red,orange, or yellow zone, forewarned is forearmed. The size of your telescope, its aperture, is important. There’s an old urban legend (that’s appropriate) going around that says large aperture telescopes are useless for urban observing. That a big mirror gathers more sky glow than a smaller one and actually shows less of the deep sky. Nonsense. Short and sweet? 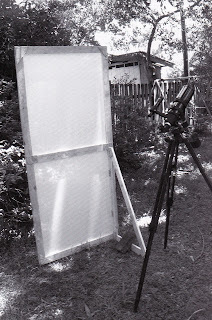 Set up a 12-inch and a 6-inch reflector side by side. You can even make the 12 an f/5 and the 6 an f/8. Point ‘em both at Hercules' M13. In the 6, the Great Globular is just a bright blob. In the 12, even under poor conditions, it is a ball of tiny, tiny stars. If the sky background is too bright in the 12-inch, just pump up the power a little to spread out the background glow . All things being equal, more aperture always wins, and may be even more valuable in the suburbs than in the country. Gain as much dark adaptation as you can. Even a little is better than none. There’s nothing you can do about light pollution—other than work to decrease it over the long run—but there is something you can do about ambient light, which is what mostly prevents you from gaining a modicum of dark adaptation, from allowing your eyes to become as sensitive to dim light as they can get. Begin by turning off your porch and other intruding lights, of course. If the people next door have lights on, shield yourself from them—it’s usually impossible to get people to turn off their yard lights, even for a little while, on a regular basis. What I used to do was build stage flats. 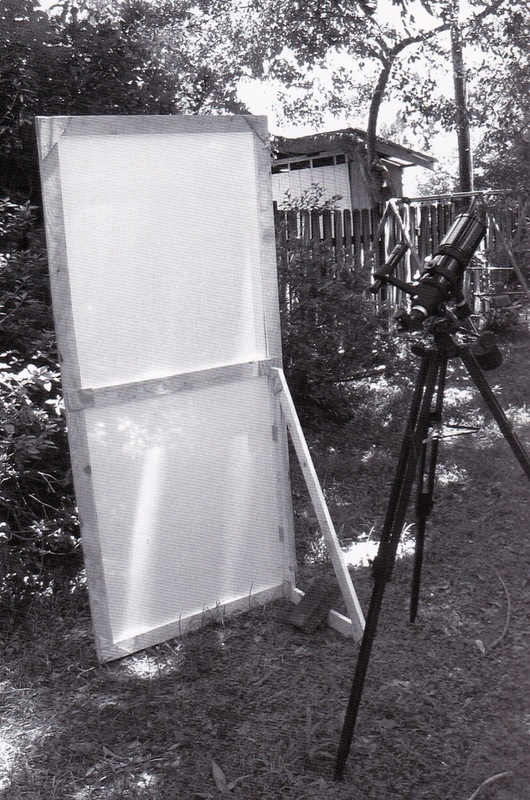 Frames of 1x4 lumber covered with muslin and painted black. Made stands for ‘em out of more 1 x 4s, and they could then be positioned as needed to shield me. Keeping ambient light out of my eyes and my telescope made a huge difference. This is so important that it wouldn’t be silly to consider building an actual observatory in your backyard. Really, one is even more helpful under bright sky conditions than under country ones. I would suggest a dome-type solution, since a dome will do more to block ambient light. Baffle your telescope. I don't mean you should confuse the poor thing. More than a few Newtonians, especially imported Newtonians, are designed so that ambient light can enter the tube through the mirror end. A simple baffle like the one I cut out of paper in 5-minutes for my old Edmund Scientific Palomar Junior will definitely improve contrast. Look for any places where ambient light can enter your optical system. If the telescope’s tube in front of the secondary mirror isn’t long enough, light is probably hitting that secondary and ruining contrast. Use plastic or paper or anything similar to extend the tube. This has the added benefit of helping keep dew off the secondary mirror. Don’t be afraid of high power. In general terms, most amateur astronomers use too little rather than too much magnification under all sky conditions. Probably because when we were novices we were warned off “300x” by the veterans. For very good reason: our imported 60mm refractors wouldn’t handle it. But your 8 or 10-inch telescope of today certainly will. While it will make extended objects like galaxies and nebulae dimmer, higher magnification also spreads out the background sky glow and darkens the eyepiece field background, often making the target easier to see. Stars will not be spread out, so higher power will definitely increase contrast of star clusters. Let me reiterate, keep ambient light out of your telescope and out of your eyes. Even if you’ve rigged up a light shield, it’s wise to go a step farther. Drape a black cloth over your head and your eyepiece. This will keep all the ambient light out, and that is particularly important when using light pollution reduction filters. If you allow light to enter the eye-lens of your eyepiece, the performance of any LPR filter, whether UHC, OIII, whatever, will be very adversely affected. I often hear newbies say they are disappointed with their light pollution filters. That they don’t make as much difference in the backyard as they’d hoped. Part of the reason is the above. 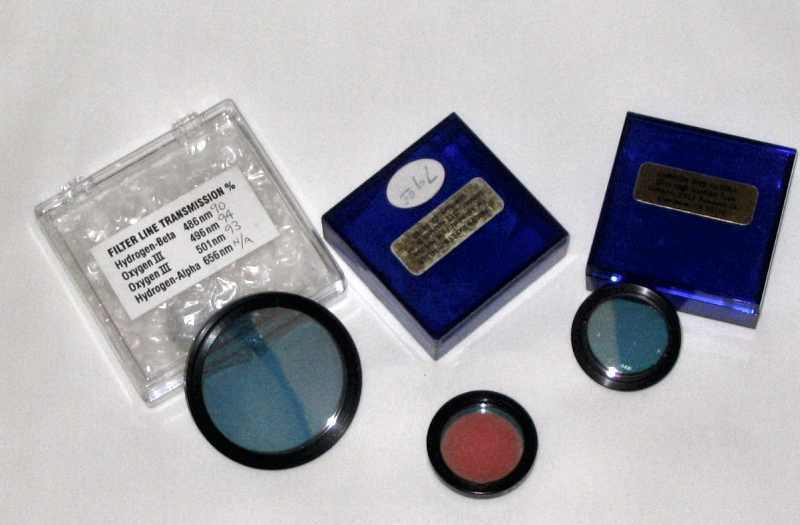 Filters, which screw onto the field lens end of an eyepiece, the telescope end, work by reflecting unwanted light away from the eyepiece. If you let ambient light enter the eyepiece from the eye lens end, it will be bounced right back into your eye from the “wrong” surface of the filter, the surface facing your eye, ruining any contrast gain you would otherwise have achieved. Use light pollution filters, but understand their limitations. OIIIs, UHCs, H-betas, they all have their places in the backyard and can make the difference between seeing and not seeing dim nebulae. They can also reveal more details in the brighter objects, but be aware they are not a panacea. They do not work on everything. 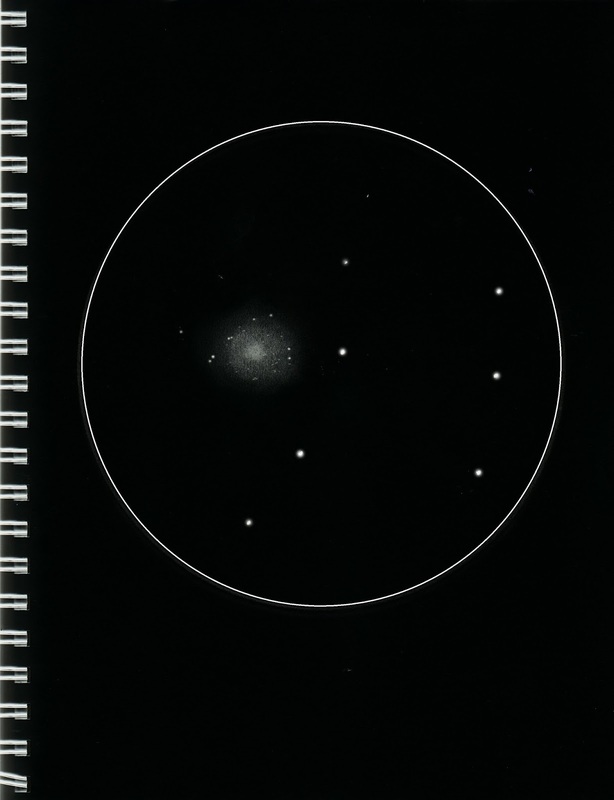 Unfortunately, as many newbs are disappointed to hear, an LPR filter won’t do squat for a galaxy or a star cluster. Those objects are made of stars, and, unfortunately, the light of stars falls in the same range of wavelengths as the earthly light the filters are designed to reject. Some people will tell you a mild filter like the Lumicon Deep Sky will improve a galaxy by darkening the background sky without dimming the target object too much, but I’ve never noticed much improvement visually (mild filters can help with galaxies during imaging). Wait for it…wait for it. Can’t snag M101? Wait for the best time. Wait for culmination, the time when the object you are chasing is as high as it ever gets, when it crosses the local Meridian, the imaginary line that divides the sky into east and west halves. Won’t do that over the course of the current evening? Come back when it will for a better shot. Even if an object is not very high when it crosses the Meridian, it is still as high then as it will ever get, and you will be looking through less air. Also wait for those special nights, nights that are especially dry and clean, like evenings after a winter cold front has passed through and cleansed and dried the sky. Dust and humidity amplify light pollution, scattering any sky glow that is present and making things worse. Finally, wait for an object to be positioned in the best part of your sky. If you’ve got a Wal-Mart to the east, wait till your prey begins to sink into the west. It’s sometimes the case that an area lower down in the sky might actually be better than the area closer to the Local Meridian. Use a red light. It might seem obvious, but some newbies don’t grok that even in light pollution you want to use a red-filtered flashlight rather than a white one. Remember, you are trying to attain as much dark adaptation as possible. How about those red-tinted "Astro-goggles" Orion has sold for years? I tried 'em; sounded like a good idea. Not only would they protect my eyes from ambient light sources, I could put them on and run into the house if I needed to without blowing out my dark adaptation. Alas, not such a hot product. I didn’t mind that wearing them made me look like the king of the nerds, but they fogged up instantly even in the winter, and I was constantly tripping over stuff and bouncing off walls. Use digital setting circles or a goto scope for object finding. While I am currently going through a non-computer “simplify” phase, there is no denying goto and DSCs are a godsend for the urban or suburban observer. If you can’t see many stars, it may be nearly impossible to find objects in star poor areas using a zero power finder like a Telrad. Even a 50mm finder may leave you lost in space. You’ll be amazed what you can see of objects in the urban/suburban sky if only you can find them. For example, the first night I had my NexStar 11 GPS, I couldn’t resist giving her first light in the backyard of Chaos Manor South. Unfortunately, it was one of the haziest spring evenings in a while. Couple that with the light pollution of my red zone, and I didn’t expect to see galaxies. I keyed in M64, anyway, and when the goto stopped, I inserted my 12mm Nagler and had a look. At 233x, there it was, the good, old Black Eye galaxy. Not just visible, but showing off the dark spot, the black eye, almost as well as from the club site. Use the same visual observing tricks you use from a dark site. Look away from a dim object instead of straight at it to bring your eye’s dim light receptors into play. Use averted vision, that is. Still can’t see your quarry? Jiggle the scope. The eye has an easier time seeing dim moving objects. Use all your standard tricks. And so it was that on one recent evening that I again found myself out under a light polluted suburban sky with a telescope. Yes, the skies of the new manse are usually better, considerably better, than they were at Chaos Manor South, but not on this night. In addition to heavy haze and intermittent clouds—this has been such a lousy summer—there was a fat gibbous Moon hanging in the sky. Seeing what the bright sky could offer up wasn’t my motivation for braving the bugs, anyway. 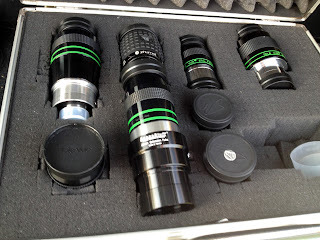 My mission was to begin testing a set of eyepieces I am evaluating for a magazine article. That was exactly what I focused on for a couple of hours: serious business. Once my work, which had been easy enough to accomplish in the horrible conditions—all I needed for ocular testing was the Moon, Saturn, and some bright stars—was done, I thought I’d have some fun. See what I could pick out of the mess. “OK, then. No M13 or M92. What else?” I looked around. I could see the Dipper, but the idea of trying to find the Owl Nebula or M108, much less M101, on a night such as this seemed patently ridiculous. Out of all the “rules” I listed above, however, the one I’ve taken the most seriously is “Don’t Give Up.” If you want to be an urban or suburban astronomer, you have to banish “surrender” from your vocabulary. You will not go inside without seeing something. Well, I could see Vega shining bravely. If I couldn’t see the ring, I’d at least see the Double-Double. I used the Rigel Quick Finder to position Zelda on the sapphire of a bright star. 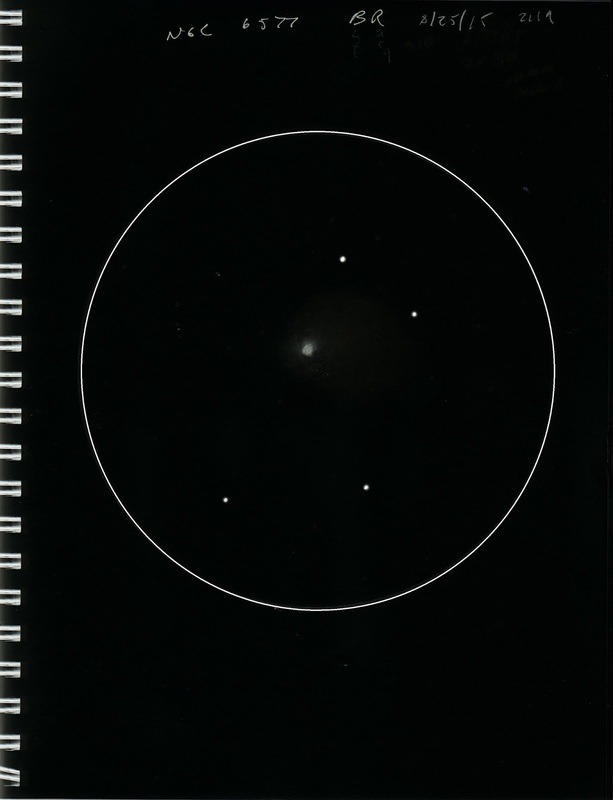 Then, looking through the scope’s RACI finder, I slewed across the little constellation, which was nearing zenith, to the two stars opposite Vega, Gamma and Beta, Sulafat and Sheliak. Once there, it was trivial to get on the Ring Nebula’s field. Since I was a boy, I’ve known the planetary nebula’s position well; it’s just about halfway down an imaginary line drawn between the two stars. Nudged the scope one last smidge while looking through the finder (scope), and then put my eye to the 15mm 100-degree AFOV eyepiece. “OK, where are you, you little sucka?” One thing I remembered from my urban astro salad days was that you can’t always depend on even the brightest objects to jump out at you. Always examine the field carefully. I did that and there was M57, a somewhat ghostly smoke ring. Was it better in my 10-inch than it had been in my 4-inch Palomar Junior (which I often used in the early days of my urban observing)? Yes. Was it that much better? Not really. Frankly, it looked a lot like it does in this rather crude drawing from decades ago. Conditions were so poor by now that even Zelda’s ten inches of aperture didn’t help much. When I added a UHC filter—I wanted to be sure the eyepieces I was testing were smoothly threaded for filters—the view improved a little. I could see that the center of the ring was filled with haze more easily than I ever could with my Pal, and I could pick up a few of the dimmer stars scattered across the field, but, no, it wasn’t that much better. Which didn’t matter a bit. As I had been on so many city-bound nights, I was just bowled over to be able to see anything and surprised at how good a deep sky object could look under such atrocious conditions. I looked, and I looked, and I looked. Until a batch of real clouds shut us down. Had I seen as much as I would have on a clear, moon free night? Or from a dark site? No, not hardly. Had I had fun anyway? You betcha, and that is what matters most to me these days.